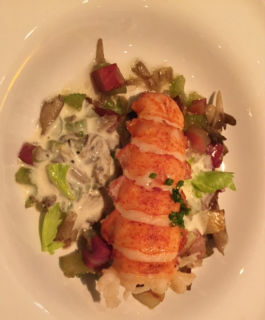 I learned that an hour before both the lunch and the dinner service in the four main dining rooms are due to start, the kitchen chefs prepare an example of every dish on the menu for that meal, so that any fine tuning that is needed can be provided before the food service starts. I found this interesting when you consider that many of the dishes are repeated weekly. One would think there would be no need for this check but it is another illustration of the quality assurance programs that are so important in assuring consistency and safety aboard. 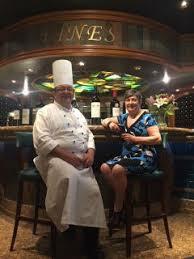 I noted the fact that, like chef Amadeo, many of the cruise ship chefs I had encountered were Italian. 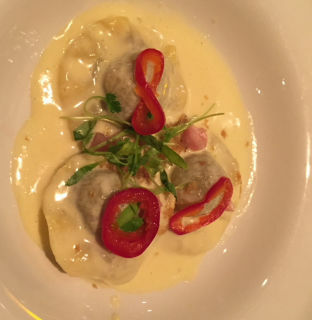 He was born in Verbania, near Lake Maggiore in Northern Italy, and his passion for cooking came from his grandmother. After training at the Institute of Culinary Arts in Stresa, and working for everal years in Switzerland, he returned to Italy to work at prestigious hotels and restaurants. In 1988 Chef Amadeo joined Princess Cruises to travel the world and 8 years later was appointed Executive Chef on the original"Love Boat." Next year he will celebrate a 30 year anniversary of serving on Princess ships. He has worked on almost every ship in the Princess fleet except the newest ones. He mentioned that despite the allure of traveling the world while they work, recruitment of the younger generation of European trained chefs to work on board was becoming increasingly difficult. I hadn’t really considered the fact that life as an onboard chef is very different to that of a chef working in a restaurant. On land, the restaurant chef can go home each night whereas with many cruise ship contracts a chef may be at sea for as many as 9 months consecutively at a time, only going home for brief intervals as each contract ends. This makes it difficult to establish a solid family life and social circle on land. I asked, as a teacher and mentor to many young chefs, if there was a message he would like to convey to the upcoming generation of chefs. 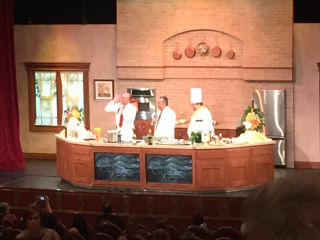 His response was that his 30 years at sea has afforded him the opportunity to travel the whole world, and to meet people from all over and all walks of life, and he encourages new chefs to experience this opportunity. Consistency is the key. I am always impressed by the variety, the quality and the freshness of the food on board, from the buffet to the specialty restaurants. But I took the opportunity to ask Chef Amadeo about my pet peeve. The one thing I look for at breakfast is a tasty Greek style yogurt and all that is provided is those gummy unhealthy low fat yogurts, either plain or sweetened and with added fruits, that need need fillers and stuff to make them barely edible. It can't just be a cost factor. Chef told me I would be surprised how many people read the labels obsessively to make sure that there is zero or 1 % fat. I guess neither the purchasers or the general public have cottoned onto the fact that "low fat" products are a major cause of the obesity epidemic in North America. Anyway I keep adding that to my commets on the survey form and live in hope that on my next cruise I will find a decent yogurt on the reakfast buffet so I don't have to bring my own with me. 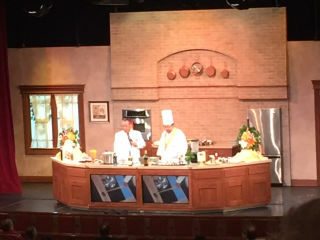 On the last day at sea, Cruise Director Peter introduced Chef Amadeo and 40 year Princess employee, Maire D'Hotel Georgio Pisano (from Southern Italy) for a Culinary Demonstration in the Princess Theatre. On the program were three recipes; Caesar salad, a linguine dish but it was the Twice Baked Goats Cheese Souffle that caught my attention. I immediately added the ingredients to my grocery list for my first shop when I arrive home. Yum!